Well, it happened again; another encounter that spawned a delayed case of extreme Porsche deja-vu. 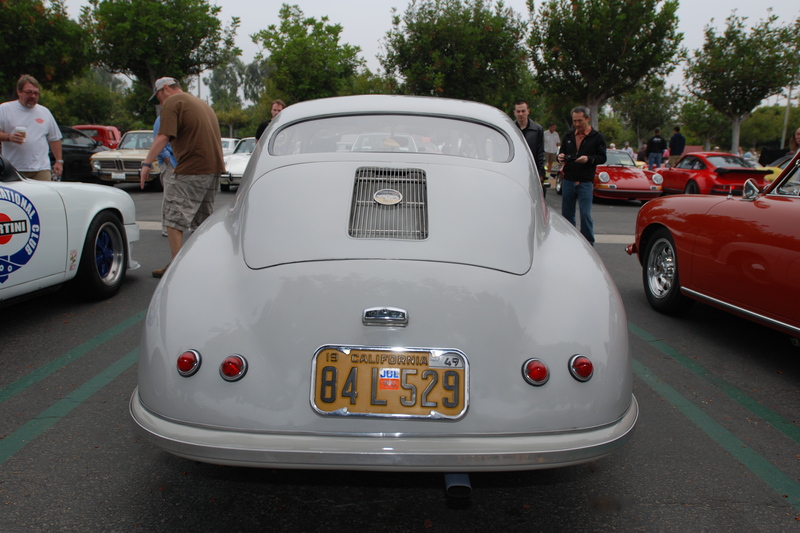 It all began with my coming face to face with an incredibly rare Porsche 356 on Saturday morning July 7 at Cars&Coffee. As I was driving into the parking lot around 6 AM, I noticed a curiously proportioned Porsche 356 already parked between several other Porsches. After finding my spot and parking, I headed straight towards the middle of Porsche row, where this unique Ivory colored 356 was located. 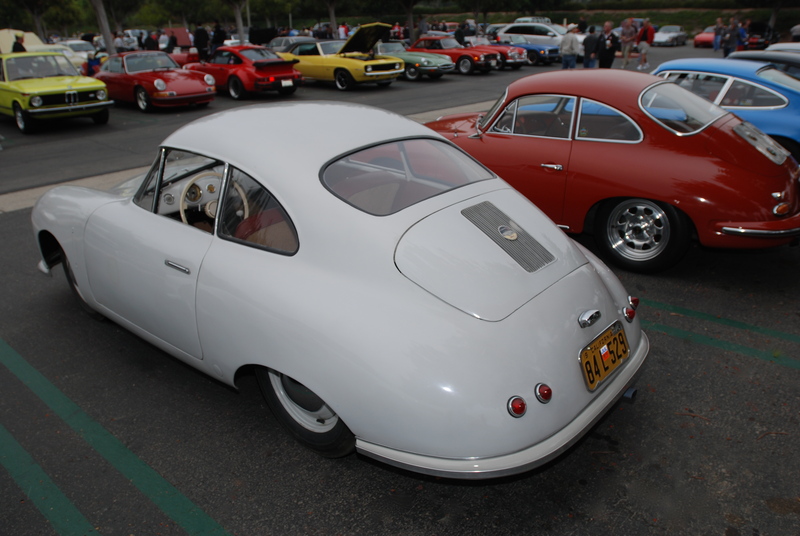 I quickly realized based upon the profile, unique contours, the shape of the hood, the presence of a split windshield and several other subtle design details, that this Ivory colored 356 parked before me had to be one of Porsches earliest production models; a Gmund coupe. By the time I made my way to the back of the car, the details observed out back helped to validate its identity. 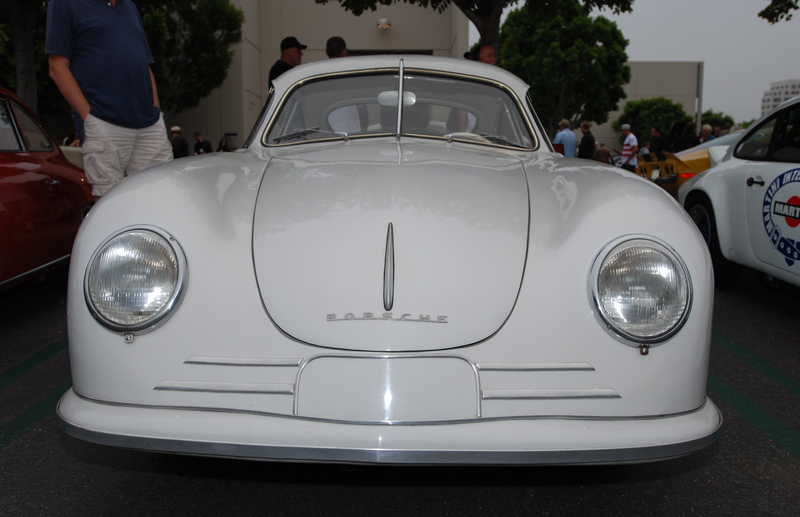 The broad contoured rear fenders, accented by the pair of small, dual beehive rear tail lights, combined with the small, sharply raked rear window and vintage California license plate, all worked together to establish this car as a true Porsche Gmund Coupe. 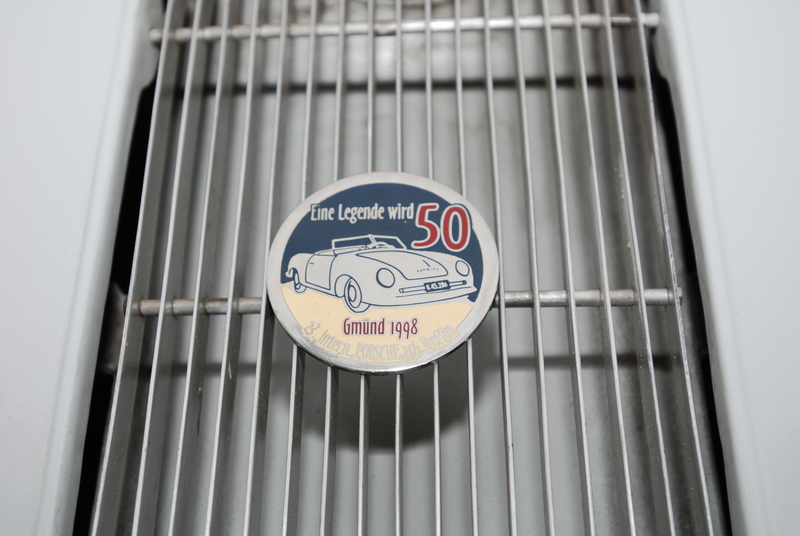 The single grill on the rear deck lid also held a subtle clue as to this cars identity; a commemorative badge proudly displayed, which translates to “A Legend becomes 50”; a reference to the 1948 debut of Porsches Gmund built vehicles, beginning with the first 356 (356-001). As I circled the coupe, photographing it from a variety of angles in an attempt to record its very presence at the event, I could hear parts and pieces of conversations taking place in the groups standing around the car. 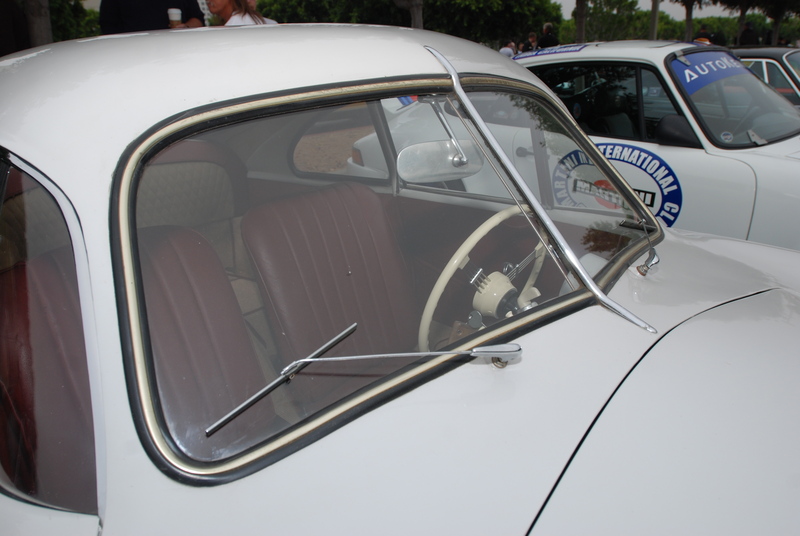 The common questions being asked had to do with the nature of this car; what model is it, and what year was it built? The thing I find very interesting is that there seems to be three very distinct camps with opinions regarding the total number of Gmund vehicles built. 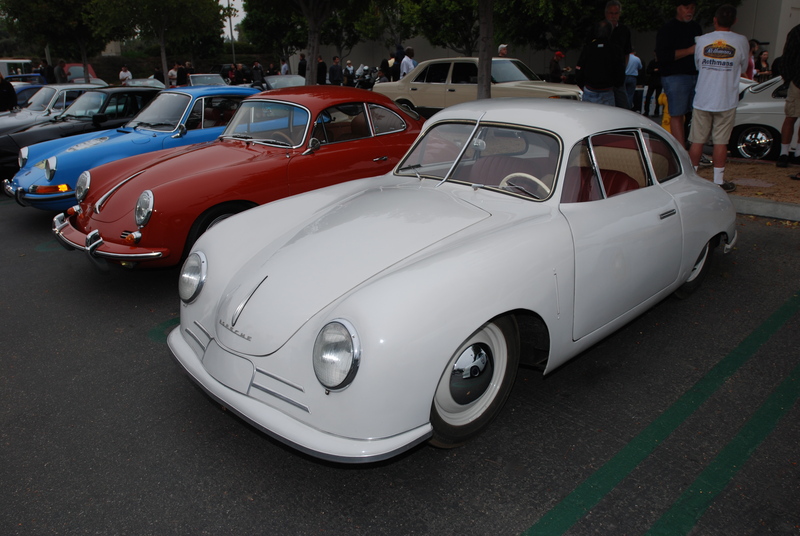 In one book that I read, the author suggested that between 1949 and 1951, Porsche produced a total of only 49 Porsche 356/2 Gmund models. He went on to state that of the 49 total produced, 41 had been built as coupes, while the remaining 8 cars were constructed as cabriolets. The second camp believes the Gmund production numbers to be at 50 cars. However, it is the third group that appears the most optimistic. 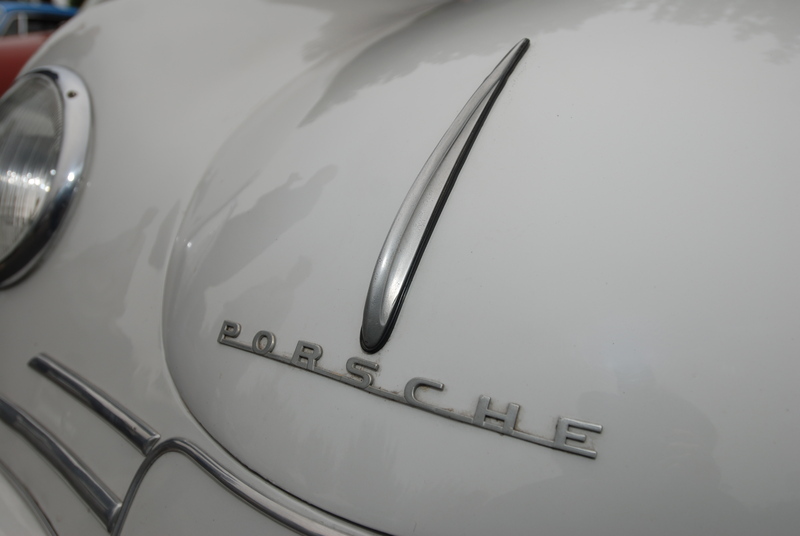 Accordingly, their research suggests that Porsche initially produced a total of 52 Gmund vehicles, and later crafted an additional 11 Gmund bodies, intended solely for racing. 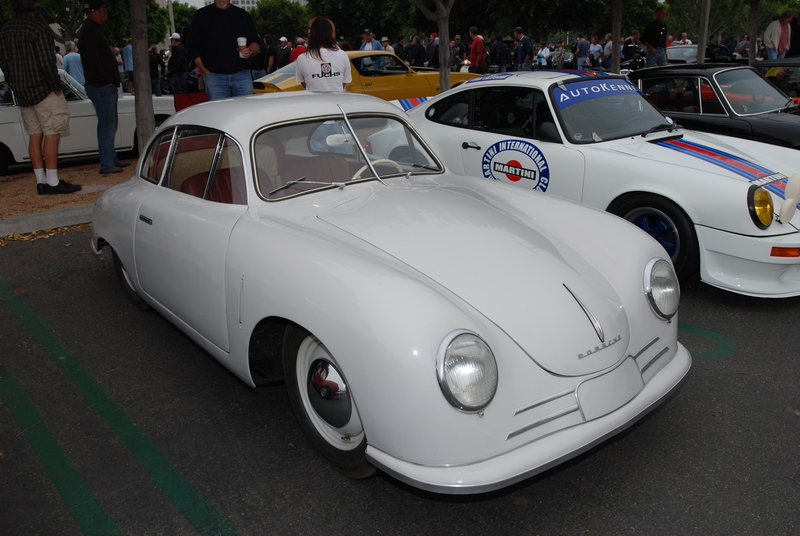 I later learned from a very reliable source that this particular car is actually chassis number 50 (356/2-050). That number makes it one of the last Gmund coupes produced by Porsche. The one missing piece of the puzzle however, has to do with the cars build date. Is this a late 1950 or 1951 model? Fresh on the heels of my encounter with the Porsche Gmund coupe at Cars&Coffee, when I arrived home after work on Monday evening, I was greeted by two car magazines that had just come in the mail. The first was “Excellence”, the Magazine about Porsche, and the second was “Christophorus”; the Porsche Factory’s in-house publication that celebrates all things Porsche. Because the June /July 2012 issue of Christophorus would be # 356, it was only fitting that Porsche dedicate the entire magazine to a celebration of the 356. As I thumbed through the issue, I discovered a section highlighting five cars of significance selected from the Porsche museum, one of which just happened to be a 356/2 Gmund coupe. Interestingly enough, in the brief write-up about the museum car, a reference was made regarding its rarity; a total of only 52 Gmund vehicles produced. After finishing my review of Christophorus, I shifted over to Excellence and began skimming the articles. Midway through the magazine, I turned the page only to discover an article titled “Pure Joy”: 356/2-045 – Out of the mud grows the lotus”, and a photo taken of the front end of a red 1950 Porsche Gmund coupe. That’s when it hit me; this car was virtually identical to the Ivory colored coupe that I had just seen in person. 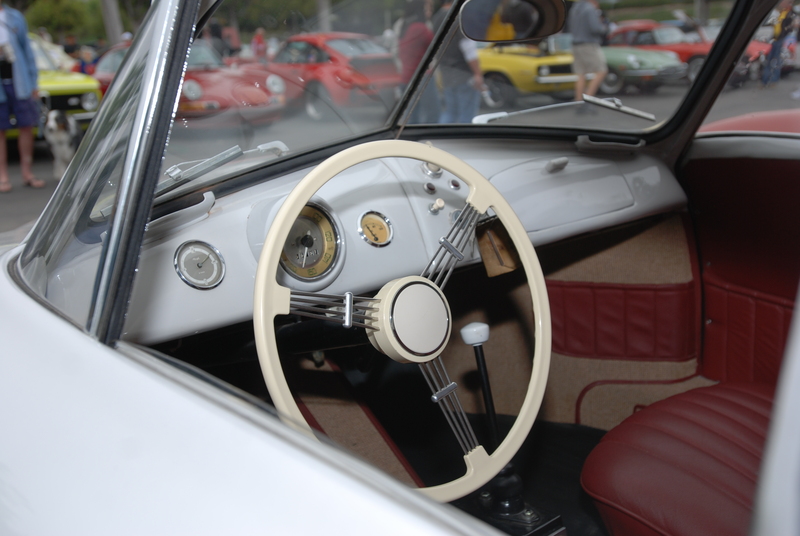 After eagerly reading the article, I learned that the car featured in the article (chassis # 045) had undergone an extensive 2 year restoration, which concluded with its entry into the Pebble Beach Concours event in the summer of 2011, where it scored a first place victory in the “Postwar Sports Cars, Closed” category. Even more impressive is the fact that the car is owned and had its restoration commissioned by a member of the Porsche family; in particular Hans-Peter Porsche, one of Dr. Porsches four sons.